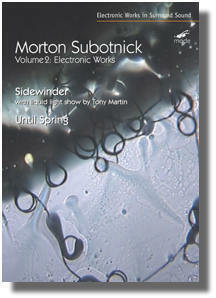 A new release DVD on Mode of two works taken from the original master tapes: Sidewinder , like Touch , created for the first commercially available quadraphonic record player, is heard for the first time in 4.1 surround sound with a new liquid light show by Tony Martin; Until Spring , appears for the first time in 5.1 surround sound. Sidewinder. Also included are over 90 minutes of interviews with Morton Subotnick and Tony Martin and biographical "right arm" stories by Morton Subotnick.